This city flag is at <www.rtspecialties.com,> , where also the city Coat of Arms can be seen. 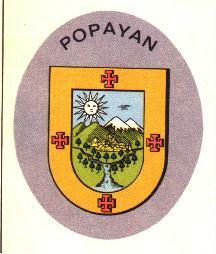 Popayán is the capital of Cauca department. Its flag has 4 crosses of Jerusalem on it. I don't think these are Jerusalem Crosses; if I were to blazon it, I'd call them Quadrates potent, though this is probably wrong - let's just say that they are squares with "T" shapes emerging from each side. They are crosses potent quadrate.